We’re off the NAS train for a bit, coming back from the underwhelming Dalmore KA III, back at you with another Bruichladdich. 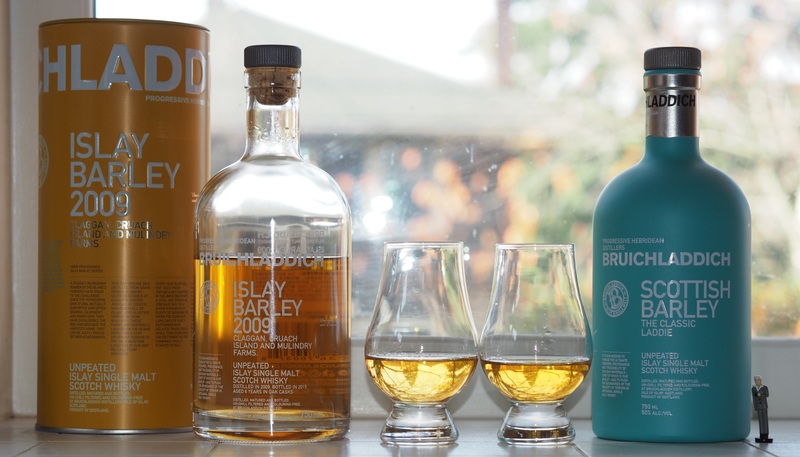 I’ll do a little compare and contrast with the Bruich’ Scottish Barley, AKA Classic Laddie. Note, the Islay malt does have an age statement. On the bottle it states “Distilled in 2009, bottled in 2015. Aged 6 years in oak casks.” So, this has been sitting around in bottles for two years. 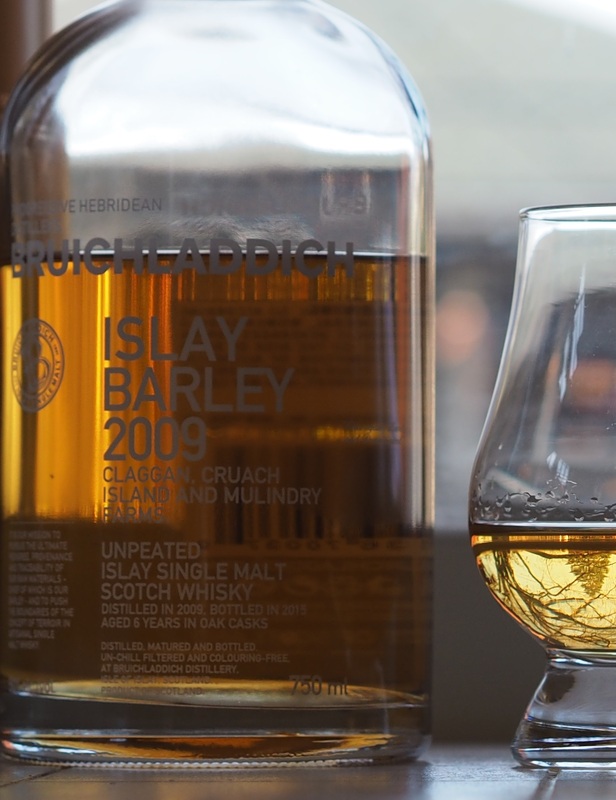 Similarly, the currently available Islay Barley shown on the Bruich website is from 2010. (Oddly, where the 2009 is redundant stating the time spent in cask, the 2010 bottle is silent on that subject.) So, you wonder, how does a 6-year old stack up to the standards from other distilleries aged 10-12 years? We’ll see below. Let’s see what goes into making this whisky. Click to expand, you can read their record of provenance. From their website. Go Oregon! Cold, in their focus, working a man within weeks of his death. We can hope, I think, he died of old age <g>. Actually, the people there were quite friendly and outgoing. (More on that when I write up my whisky tours and visits.) I tried this expression on our visit there, and remember it from the tiny ‘driver’s taste’ that I had as being pretty damn good. The wife (who got to taste a whole dram) was so impressed she bugged me as soon as we got home to find a bottle. Hence these reviews! We’ve tried both the current Scottish (Classic) and Islay Barley expressions. Both are bottled at 50% ABV and with no coloring or filtration. The Islay Barley, like the Classic, is an honest straw color, as you can tell from the photos — and sold in a clear bottle to show it off. Let’s get down to smell and taste. Winter light makes the bottle look darker. The Glencairn glass shows the true color of the whisky. On the nose, the Islay Barley is a bit gentler than the Classic — no sting on the nose, but also less of the grass and floral aroma the Classic has. That’s probably a trade-off of the longer maturation. What you get is a smoother delivery of the essential mineral character of the nose. I also noted a pleasantly funky maritime wrack — thanks to the casks being aged onsite, right next to Loch Indaal (a bay, really, so salt water). This aroma brings me back to that bleak Islay coast. 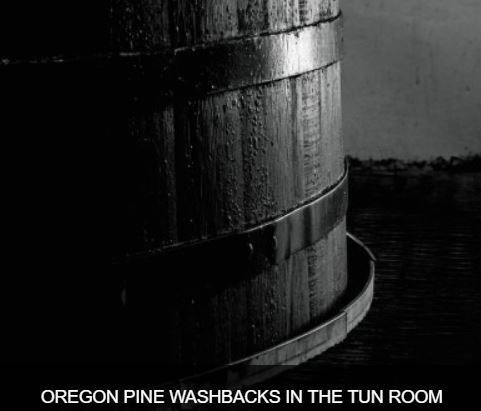 The whisky is also smoother over the palate than the Classic. Where the Classic is prickly with white pepper and its toffee is in the background, with the Islay Barley, toffee is in the foreground. Its peppery notes and tannins are more reserved. This is not a ‘smooth’ dram, however. It’s not Lee Ritenour smooth, but more like a young George Benson where the Classic is Al DiMeola. Nose (unwatered): Did not sting me like the Classic did. Mineral and wrack, hints of toffee. Palate (unwatered): Creamier than classic, it really brings the flavor forward. The foretaste is toffee and both treacle and vanilla. Less white pepper on the sides of the tongue but still plenty of tannins to balance the sweetness. A touch of water loses the creamy intensity, but does not uncover any hidden tendencies. 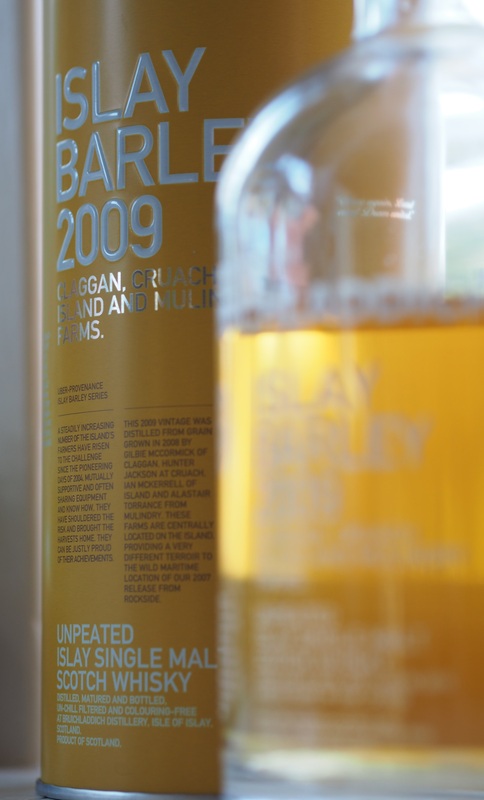 Finish (unwatered): The Islay Barley is certainly a step up from the Classic. If you find the Classic too lively and spicy, the Islay is your step towards refinement. It loses a little of the Classic’s youthful exuberance and interesting nose in exchange for a luxuriously rich palate. There is still some liveliness to the flavor — you won’t mistake this for a 12-year Speysider by any means. It is worth a try for its unique approach to the Islay tradition. Bottom Line: Note that I tasted these at their bottled strength. That is a testament to the smoothness of the product. Yes, I call out these malts from Bruichladdich for being lively, but remember, that’s at 50% ABV. They’re lively, not harsh, and that’s not bad. So, does the distiller’s maniacal attention to detail pay off? Do you get what you pay for? The Classic is a rougher, though nicely complex, NAS expression for $50 around here. I think it is worth it and a good daily driver. In fact, the wife prefers the Classic. I prefer the Islay Barley and at about $70, I would consider this a ‘special occasion’ whisky — where Friday might be a special occasion. It’s in the same class as a Glenfarclas 17 or Balvenie Doublewood. Different than these, but good. It’s no wonder Uncle Charlie, our taxi driver for a day, spoke highly of the Bruichladdich folks. We probably would not have made the trip that final day to visit the distillery if it weren’t for him. Thanks Charlie! This entry was posted in Scotch-single malt, Whisky and tagged Bruichladdich, Islay, Scotch, single malt. Bookmark the permalink.